High time to post some pictures of Shannen Doherty and Kurt Iswarienko’s wedding in Malibu last October, orchestrated wonderfully as always by David Tutera. Shannen and Kurt’s wedding was captured on film for her new We TV reality show, Shannen Says, that premiered earlier this year. With a loyal fan base from her Beverly Hills 90210 days, Shannen has a perfect platform to give us an insight into the process of a planning her own celebrity wedding. 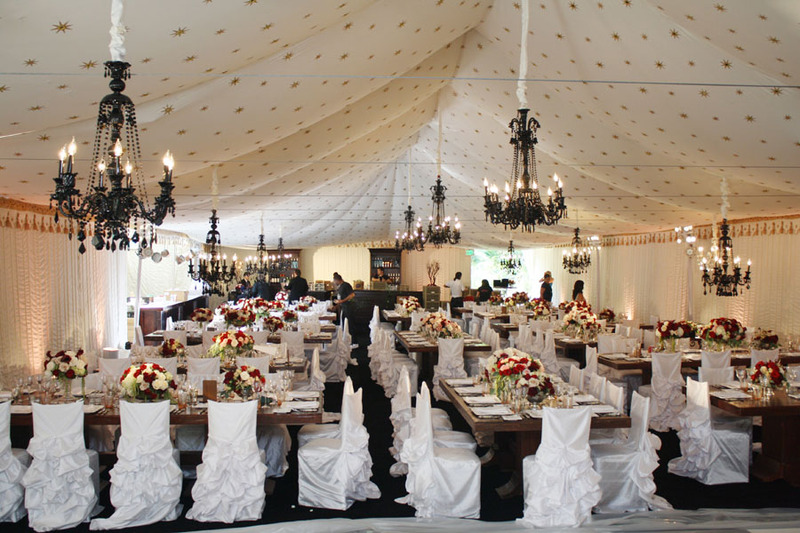 With an elegant classical wedding theme, where Shannen was determined to have a strict color palette, Raj Tents provided an ivory interior with gold accents for the dining tent. The dress code was black, so along with the black chandeliers, the effect was striking. The ivory ribbed walls were surmounted by a large rosette ivory and gold scalloped valance that connected to the ceiling printed with gold stars that had mirror work, so the entire canopy twinkled in the light of the chandeliers. Raj Tents also covered the exterior walls of the tent with fabric wall panels and scalloped valances to make it fit with the beautiful Malibu canyon setting. Pergolas in ivory and gold framed the other side of the lawn, with one being a ‘Ladies Perfume Lounge’ – fabulous idea. Watch out for further episodes of Shannen Says on WE TV.